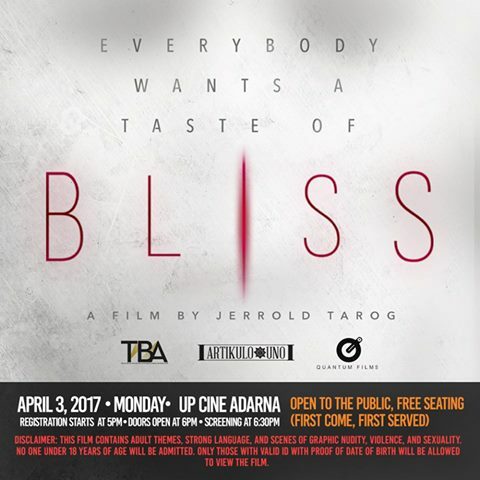 After getting an X Rating from the MTRCB, Jerrold Tarog's "Bliss" finds a way to have a showing outside of the regulatory board's jurisdiction. Set for a one-time screening on April 3rd, Monday at the UP Film Institute's Cine Adarna cinema. The screening will be totally free and will be on a first come, first-serve basis so better be there early. Registration opens at 5 PM while the film screening set to start at 6:30 PM but make sure to bring at least one valid ID with date of birth. For obvious reasons, the screening requires verification of one's age due to the adult and sexual themes of the movie. Jane, an actress-turned-film producer, gets into an accident. Soon after, she begins to hear mysterious sounds and visions and struggles with people seemingly want to harm her. "Bliss" stars Iza Calzado and Ian Veneracion in the lead roles while Adrienne Vergara and TJ Trinidad complete the cast. "Bliss" was set to open May 19, 2017 but due to the X-rated rating, may be banned from the public. The film has requested a second review of their X rating which is still pending as of writing. Let's hope the appeal works without forcing the producers to create a toned down version of the film.